This is a homemade stripboard cutter. I already have a commercial stripboard cutter, so why make another? My commercial cutter is really horrible to use, the handle is tiny, uncomfortable, and the cutter isn't nearly sharp enough. This makes it frustrating to use. My homemade version is bigger and sharper, it's now a pleasure to use! The larger handle and sharp blade mean it takes no effort to cut the tracks in the right places. What is a stipboard cutter ? 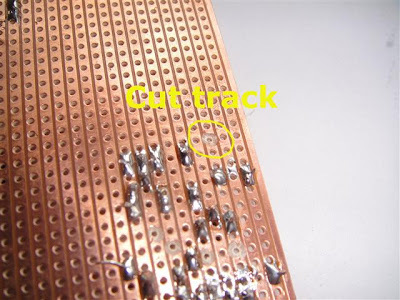 It's a tool for cutting the tracks on a prototybe board to disconnect parts of the circuit that shouldn't be connected. This tool won't take more than 15 minutes to make. 4mm drill bit (new and sharp is best). This will form the cutter. Sandpaper if you're carving your own handle. I carved the handle from a small branch I found in the garden. Drill a 3.2 mm hole in the handle for the 4mm drill bit. Push the 4mm drill bit into the handle, this will take a little force, it should be a tight fit.